The neighbor down the street just had a kid. So did your newlywed sister. 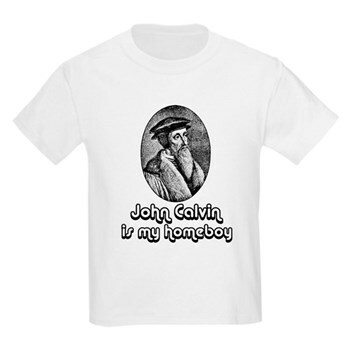 Just what do you give to the would-be evangelist kid who has everything? Try these suggestions from EvangelismStuff.com (except for the last one, which is really horrible). Want to see more (especially that really horrible gift not from EvangelismStuff.com)? How ’bout something for that budding reformer? But please, please, ignore this one. Answer to first shirt: Repent! Did I forget to capitalize Dale or something?